The Yamaha MM8 represents an evolution of Yamaha’s workhorse workstation line based on the original MOTIF synthesizers, which have quite a reputation for being quality products. 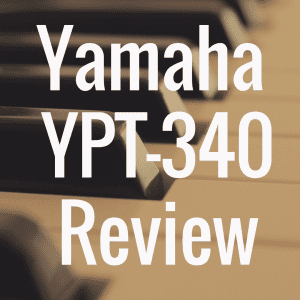 I knew that going into this review, there would be a lot about the Yamaha MM8 that just didn’t suit me particularly well. Overall, I was able to confirm most of my suspicions about this product, but truthfully, I did discover some aspects of the product that genuinely surprised me. There’s truthfully a lot to like about this workstation, including some fantastic sounds in the stock library, a rich arpeggiator setting, and some intuitive controls. Let’s take deeper look at the MM8 by first comparing it to a handful of other popular instruments currently on the market (please use our interactive table below). Who Is the MM8 It For? One thing needs to be made clear right up front; this is not a professional level keyboard. The feature set, price point and overall quality of this product put it firmly into the higher-end hobbyist realm; I’d actually argue that it’s too highly priced for this segment. 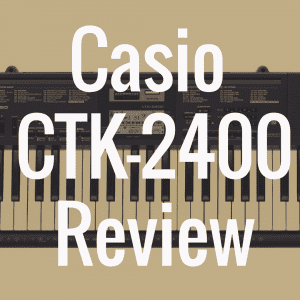 The main issue is that most beginners don’t want to pay close to a thousand dollars for a keyboard synthesizer, and those that do are usually looking for something more in terms of features and capabilities. 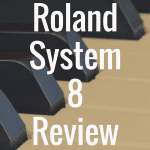 The keyboard is very lightweight, which is a huge plus, and there are certainly some pro-level features on the MM8, such has the surprisingly robust arpeggiator mode, a handful of extremely great sounds in the library, and a wide array of quality effects. But ultimately, there are many shortcomings that all but the most casual players will find a hard time looking past. 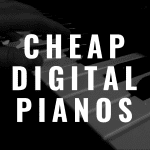 I would love to be able to recommend this product to a pianist who might be looking for a great keyboard to grow with, but even then, I feel there are better options in this price bracket than the MM8. There’s nothing particularly special about the MM8’s design or construction quality. It is primarily plastic, and in my opinion at least, it is severely lacking on the stylistic front. This product came out in 2008, so there’s some forgiveness involved here, but even so, I found myself a bit uninspired by the layout of the controls. The redeeming factor here? The keybed is actually fairly excellent. The keys are weighted, and have a very firm, yet tactile action. They are actually weighted unevenly, with the higher keys being lighter and the lower notes being more firm. Some seem to dislike this, but I actually found that it was enjoyable to play both pianistically and in a synth style equally. All told, this is a basic setup that won’t turn any heads, but it does have it where it counts. The arpeggiator is almost the standout feature of the entire workstation, so I feel the need to cover it first. There are a whopping 213 different rhythmic arpeggio’s to choose from, which is more than many pro-level synth workstations have to offer. Included are a multitude of bass patterns and drum loops to play over in order to get ideas down. Above all of this, one of the coolest features I played with was the guitar emulator. If you’ve used a synth guitar patch before, you know it typically sounds uninspired at best, and absolutely fake and horrific at worst. However, the moment I loaded the guitar patch up and began playing, I was taken aback by how incredible nuanced and smooth it sounded; I would say it’s the closest I’ve heard to replicating the actual action of a guitar in a very long time. You can even load the patch up in the arpeggiator and make incredibly convincing strumming sounds, which honestly blew my mind. Were the price lower, I’d say this feature alone would almost be worth the price of admission. The control knobs here offer fairly standard-fare, but all of the basics have been covered. There is plenty of customization to be had depending on what type of sound you are playing, and everything from filters to attack and release can be controlled relatively easily. I found that interfacing these with a DAW was simple enough; Logic had no problem assigning the various parameters I wanted when being used in MIDI mode, and the factory sounds came pre-assigned to the various effects and modulations available for each. The performance settings on the Yamaha MM8 allow you to switch between sound sets instantly, even while in the middle of holding down a note. 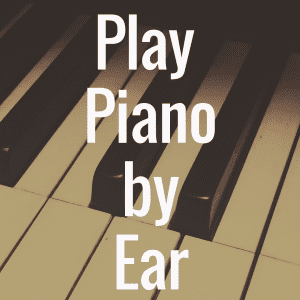 You can store individual settings such a keyboard layout, sound presets, drum patterns, effects and more. You can save a total of 64 performances on the keyboard itself, with the option to save more via a USB drive. You can also save 5 whole songs to the device, or 400 from a drive. This allows you to upload entire compositions to a DAW for further processing, which is definitely a must-have feature today. Finally, you can use the MM8 as a MIDI controller keyboard via USB cable, allowing it to drive your soft synths and other software elements stored on your computer. The number one issue with this keyboard for many will be the extremely limiting 32-voice polyphony. While for casual players, this is no big deal, someone hoping to use this keyboard for live performance will have to contend with a lack of flexibility when it comes to layering and creating textured sounds. This is pretty much a deal-breaker for me, and I know many who would say the same. Still, there’s plenty to enjoy about the sounds the engine can create. I found that the pad and string sounds in particular were extremely high quality, and I’ve already gone in depth into the incredible guitar emulation going on inside this unassuming keyboard. There is also a wide array of effects that can all be individually controlled, giving you an easy way to take command over the sounds you want to hear. You can apply EQ settings to enable more focused sounds, as well as apply your standard set of reverb, chorus, flanger, and more. There are plenty of worthy competitors for the Yamaha MM8, including a few by Yamaha themselves. Let’s look at three of these keyboards below, breaking them down by their key differences. The MOXF8 represents Yamaha’s higher end product line, bringing a wider array of features and higher quality sounds based on the higher end Motif sound banks. The MOXF8 adds full 128 voice polyphony, which compared to the 32 voice on the MM8, is a huge step up. The effects suites are also a step up, utilizing Yamaha’s Virtual Circuitry Modelling technology to its full extent. At $2000, this is definitely a step up in price, and if all you’re looking for is a quality piano, the MM8 will probably serve you just fine. If, however, you’re looking for a fully-kitted out synth workstation with legendary sounds, you might want to go up another level. The Motif XF8 represents the highest end Yamaha synthesizer line available today. 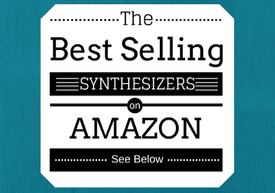 At close to $4000, Yamaha’s flagship model contains their highest end synthesis engine to date. There’s definitely a notable difference in terms of sound quality here, but is that really worth an additional $2000? Chances are, probably not for you. If you are working on a commercial project or have a professional need to have the highest end sound design possible, it might be for you. If not, though, you’ll certainly be ok with the MOXF8, and likely, the MM8 might even suffice. Again, it’ll depend on your individual needs and preferences. The Korg M50 was Korg’s 2008 entry into the sound design and workstation market. The M50 has full 128 voice polyphony and pulls its sounds from the more expensive M3 workstations library. These sounds are some of the company’s best they’ve ever released, and it really shows here in the M50. 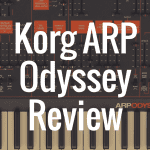 Korg has a history of having some raving fans, and if you’re one of them, the M50 is certainly a fantastic product. I’d say it’s no question that the sounds on offer are superior to what is in the MM8; I’d say the MOXF8 would be a fairer comparison to make, which is certainly impressive considering that the M50 retails for about $600. Still, ultimately these two keyboards serve slightly different purposes. The MM8 shines as a performance keyboard first and foremost, while the Korg offering leans heavily towards studio use. The Yamaha MM8, all around, is a great keyboard. There are some fantastic sounds on this synth, from the ultra-realistic guitar tones to the rich sounding pads and strings. The arpeggiator works very well, and I enjoyed playing around with the various settings and effects. Some will certainly find the 32 voice polyphony to be too limiting for their tastes, and I certainly agree. Additionally, several competitors make similarly priced workstations with arguably better sound libraries, polyphony, and features. Ultimately, Yamaha has tried to deliver a good value synthesizer piano, and I think they’ve succeeded. Whether it’ll be for you or not will largely depend on what you intend to use the keyboard for. The Yamaha MM8 packs great sounds, powerful synthesis and classic design into an affordable package that delivers on all of the core features you’d expect in a value workstation. That being said, there are plenty of things still to be desired, and with many affordable options available today, time will tell how long the MM8 can remain a viable offering.